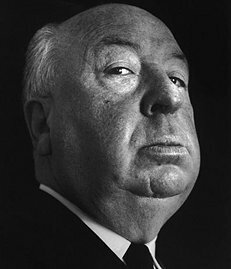 A Conversation with Alfred Hitchcock….. Welcome to a trip down memory lane. Tonight I will discuss one of my favorite films for the youngsters in the audience (i.e. those born after the 1960’s). “My father once wrote a letter to the local police station, asking the officer to lock me in jail for ten minutes. The officer complied and then he told me, “This is what happens to people who do bad things. So, I decided to put my story of reporting to my mother in the movie “Psycho” played by Tony Perkins. “As far as never being awarded an Oscar for my works of art, I’ll say that Hollywood is contemptuous! All I need is my audience! Now, if you will excuse me, I will get back to the discussion of one of my favorite films, Rear Window. Rear Window was made in 1954 (the birth year of Ladyjustice). Adapting a short story into a film is tricky… but we accomplished it. There is nothing more mundane than being laid up with broken bones and watching the world go by, correct? I beg to differ… we were able to capture the everyday lives of everyday people through the lenses of a photographer’s camera… and we discovered something out of the ordinary – a murder! As Thelma Ritter’s character so aptly tells us, “We’ve become a race of peeping Toms.” I suppose that in 2011, voyeurism could now be considered a form of stalking. If not for the idea of murder, Jeffries (Jimmy Stewart) might well have died of boredom rather than at the hands of Thorwald (Raymond Burr). We have the interesting relationship of Jeffries and Lisa Freemont, a debutant, prima donna, and unwilling sleuth. Her character is all about image, superficiality …and then the murder becomes a reality…and a life changing experience. So the story goes… In the beginning, Jeff Jeffries “innocently spies on all of his neighbors for amusement and to pass the time away” while healing from a broken leg. And then… Jeffries notices Lars Thorwald, jewelry salesman, making repeated late night trips carrying a metal case. Previously, Anna Thorwald was bed-ridden and is “suddenly gone” leaving behind her purse and jewelry.” Thorwald is seen cleaning a knife and hand saw and is in possession of a large trunk tied with a rope. Is this where Mrs. Thorwald is? A pivotal point in the story is the occurrence of a neighbor’s dog with his neck broken. As the neighbor wails and “scolds her neighbors” in frustration, everyone rushes to their window or terrace to view the scene, except Thorwald. His apartment remains dark with only a lit cigar seen. Such behaviors would appear to indicate a suspicious pattern of conduct. Lt. Doyle does a cursory investigation earlier and discovers that the trunk was supposedly delivered to Anna Thorwald’s sister with a bogus postcard sent (by Thorwald) to himself. And… as a preventative measure, it seems that the little dog “could become too curious” about possible evidence. A daring Lisa nearly becomes the next murder victim by home invasion and locates a key piece of evidence…. just like our modern day sleuths like Diane Fanning and Susan Murphy Milano! Jeff: What do you need? ‘Bloody footsteps leading up to the door? Tom: One thing I don’t need is heckling. As Tom prepares to leave, he matter-of-factly informs Jeff of one further finding – the retrieval of a postcard in Thorwald’s mailbox from his wife Anna (mailed the previous day at 3:30 in the afternoon). It says that she arrived safely in Meritsville, 80 miles to the north. The postcard’s message: “Arrived OK. ‘Already feeling better. Love, Anna.” Once he is left alone, Jeff seems disappointed by the news. He extends his reach with the back scratcher to relieve the itch on his big toe. The dog is lowered in the basket to the salesman’s garden. ‘Miss Lonelyhearts’ primps in front of her dressing room mirror, takes a few stiff drinks and then goes out, apparently looking for male company. The composer entertains well-dressed female guests in his studio. ‘Miss Torso’ rehearses a dance with a male partner and a female choreographer. ‘Miss Lonelyhearts’ enters a restaurant across the street and is seated alone at a table. The view is accompanied by a song with appropriate lyrics: “Many dreams ago, I dreamed many dreams waiting for my true love to appear though each night..” – she also briefly speaks to a passing Thorwald. More guests arrive – Village intellectuals – at a noisy party in progress in the musician’s studio. Lisa: It doesn’t make sense to me…Women aren’t that unpredictable…A woman has a favorite handbag and it always hangs on her bedpost where she can get at it easily. And then all of a sudden, she goes away on a trip and leaves it behind. Why? Jeff: Because she didn’t know she was going on a trip. And where she’s going she wouldn’t need the handbag. Lisa: Yes, but only her husband would know that. And that jewelry. Women don’t keep their jewelry in a purse, getting all twisted and scratched and tangled up. Jeff: Well, do they hide it in their husbands’ clothes? Lisa: They do not. And they don’t leave it behind either. Why, a woman going anywhere but the hospital would always take makeup, perfume, and jewelry…That’s basic equipment. And you don’t leave it behind in your husband’s drawer in your favorite handbag. Lisa:…That couldn’t have been Mrs. Thorwald…or I don’t know women. Jeff: Well, what about the witnesses? Lisa’s questioning that a woman is seen by neighbors, but that it “was not Mrs. Thorwald,” raises the question of prior bad acts and the chances that Lars Thorwald, the “Willy Lowman of jewelry sales,” could have had a woman in every major city. Although credit cards were not in use at the time, couldn’t his steps have been traced via taxi, hotel and restaurant receipts, train station logs and accounting records? Why didn’t Lt Doyle question telephone operators? And… Anna Thorwald was bed-ridden. What about previous medical records determining what her true state of health was? What was the MD recommendations? Was there an insurance policy on her life? What was the relationship of Thorwald and his employer? Was he in good standing, or was he trying to make a career change with a new woman by his side? Who was the woman seen leaving with Thorwald as Jeff Jeffries slept? If she was a co-worker, of Thorwald’s sales company, would she have been questioned? Suffice it to say, had Susan Murphy Milano been older than a little bambino,…. and had her “Time’s Up” book been written, Anna Thorwald could have… hired a lawyer; secured her personal records including medical and insurance company records, found alternate living arrangements, perhaps made a recording of her abuse and kept 10 steps ahead of Lars, her abuser. Such a pity! Not even Hitch himself could have been “the master planner” for survivors of crime.